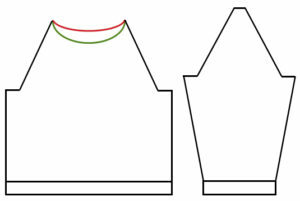 The chart for the initial concept: The number of needles used for “pleats” is constant (7); 3 stitches move up (or down) in turn, indicated by arrows. 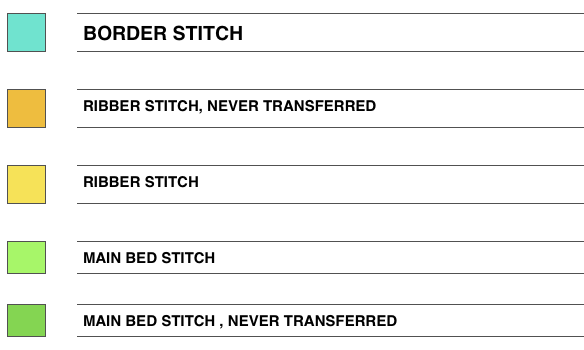 After the first 3 are transferred, 3 more are now moved adjacent to the now remaining 4 stitches from the opposite bed in order to maintain the total of 7 on each bed, excluding any borders, in which stitch placement remains fixed. 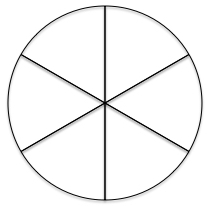 There is a resurgence of circular yokes on the runways and market at the moment. My previous post discussed some of the considerations in knitting them. For those not up to working that particular way, there are variation in carrying the patterns around the body in “continuous” lines. 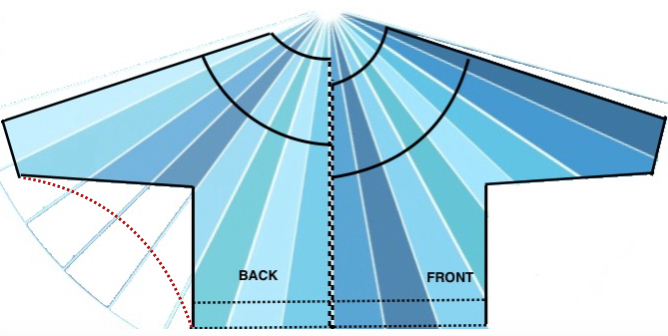 If raglan shaping is used, angular lines are created where patterns meet. 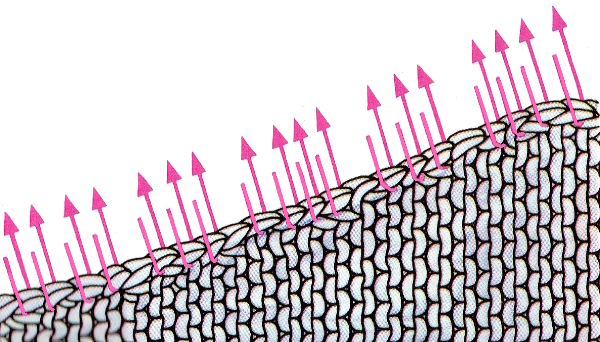 All knit is essentially vertical striping. 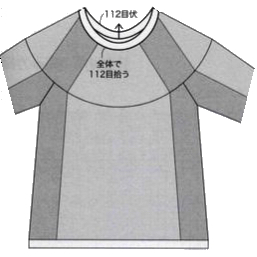 Raglan shaping should match both front and back of sleeve, the wider the raglan shape, the less sharp the stripe intersection. 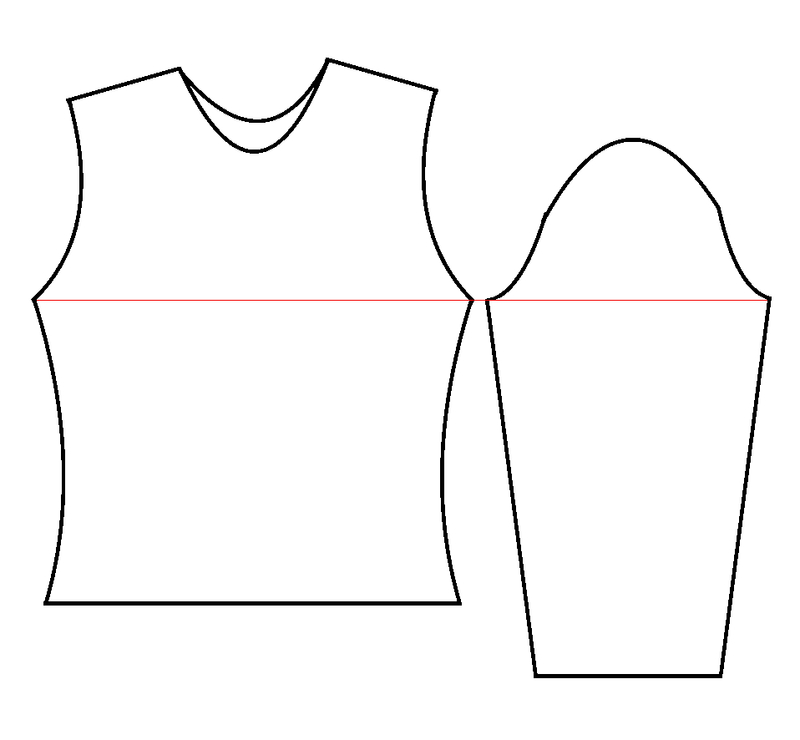 Striping in a traditional cap sleeve creates designs that move horizontally across combined body and arm at rest. 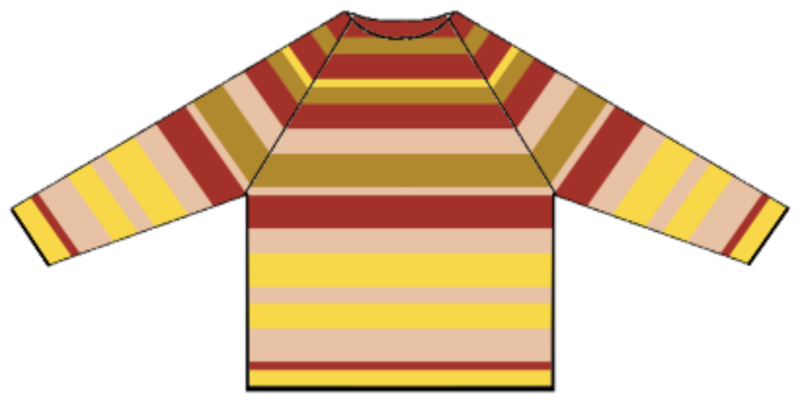 When designing a sweater with a shaped sleeve cap, knit a sample of your stripe pattern. 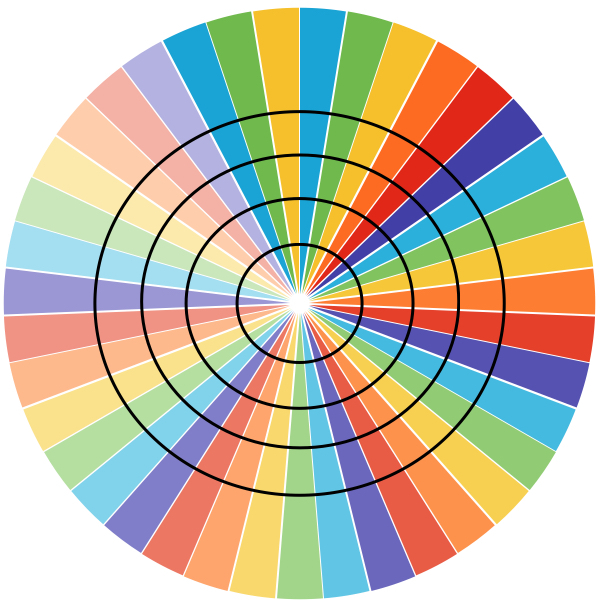 An online stripe generator can help visualize stripe formulas, color ways, etc. 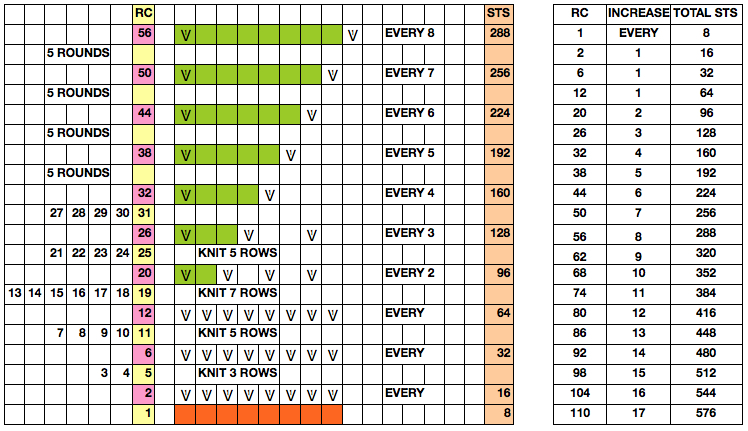 If knitting fair isle use row counts for FI pattern height for stripe placement. 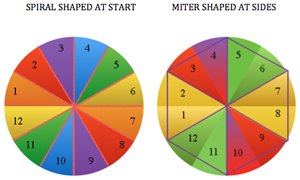 It is helpful to have a 1 row, 1 stitch graph to plot repeats out. 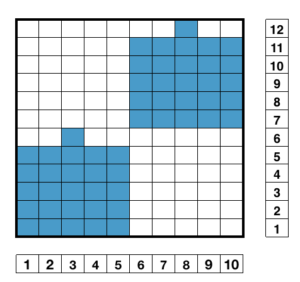 It does not matter if the grid is square or rectangular, providing that vertical and horizontal numbers are based on your gauge. 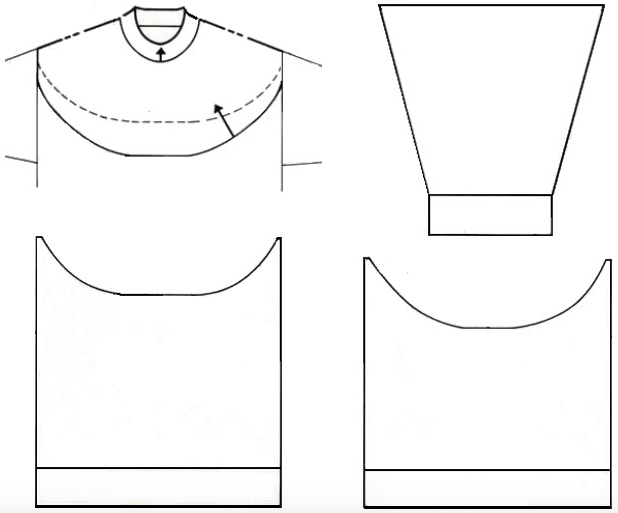 Draw a line from armhole point to armhole on both pattern and sleeve, and there is your match. 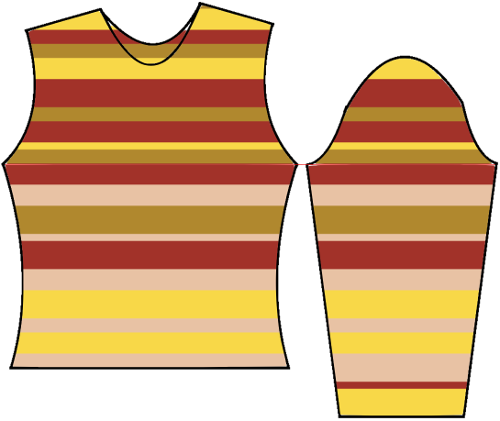 Work stripe pattern up from armhole line for your cap, down from line for sleeve repeats. 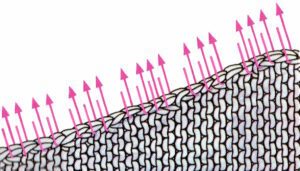 In my theoretical sweaters the sleeve’s wrist edge is technically below the armhole to waistline length, so stripes need to be plotted accordingly, from armhole down. 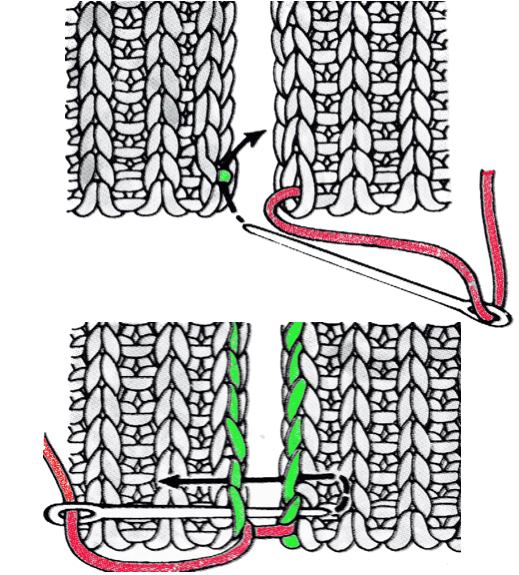 The same method is used if single motifs or other variations in striping are involved. 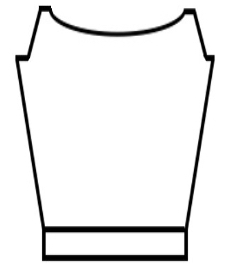 For single motifs, if matching them in body and sleeve cap, begin by designing them so they fit in the cap’s crown. 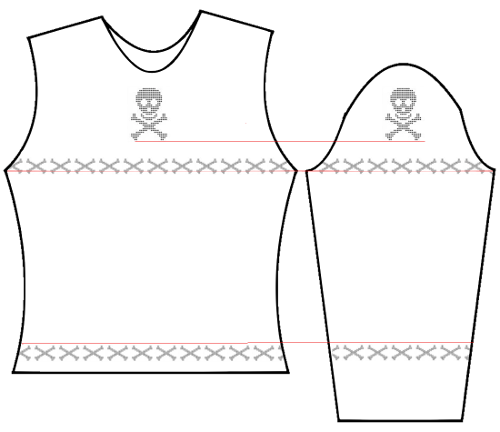 Place motif in body and sleeve on same line, and plan the remainder of the sweater calculating from the armhole as for stripes, basing placement on numbers of rows in each design segment. 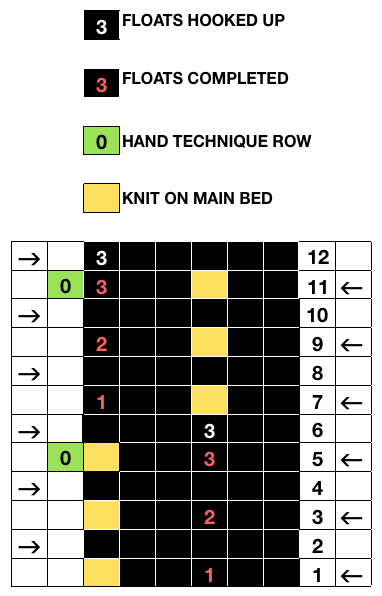 The main bed knits in slip stitch pattern for 4 rows, then knits 2 rows across all stitches. Floats are created every blank row throughout, composing the knots or butterflies. 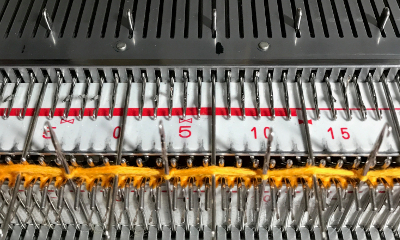 The ribber is set to knit (N,<–>N, will pick up stitches only on selected needles. The fabric is a slip stitch one, so it will be short and narrow. That is something to be considered when planning cast on, bind off, and beginning and ending edges of the piece. In Japanese machines a ribber comb is recommended. If casting on single bed, start with waste yarn, poke the comb through that, and proceed as you would for any other rib fabric. Fabrics worked single bed with groups of pulled up stitches on the purl side will have some distortion of the stocking stitch side depending on weight of yarn used, the number of rows hooked up, and stitch type. Working on the opposite bed to create the floats produces a more balanced fabric. 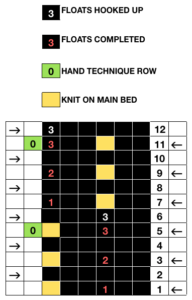 While knitting in pattern the ribber pitch is set on P (point to point) to keep stitches on opposing beds centered (P pitch also makes it easier to transfer directly from one bed to the other). 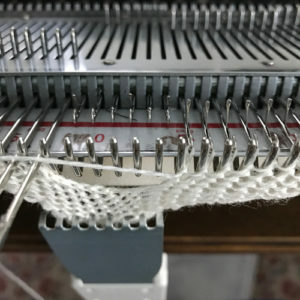 If the cast on is for an every other needle rib with stitches then transferred between beds for pattern knitting set up, the cast on and any all rib rows need to be knit in H pitch, with switch to P for transfers and knitting in pattern to be completed. 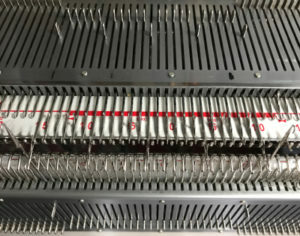 With first row set up on selected segment of needle bed, there are additional steps to take. 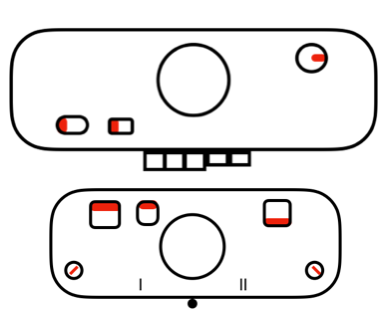 With COR: set RC (row counter) to 000. Make certain proper part (slip) buttons are engaged. 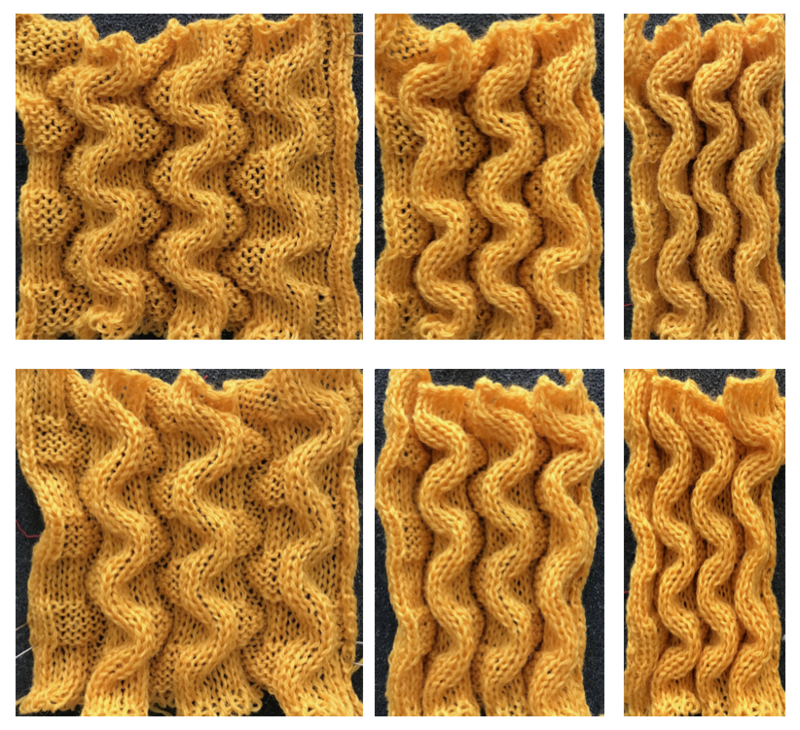 MB knits in pattern based on selected needles, ribber knits when moving from left to right. 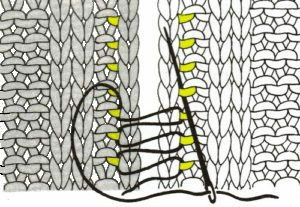 The fabric is tubular Hand techniques will now also occur when carriages are on the left, on RC 5, 11, etc as described in hand technique chart, on rows with no needle selection. 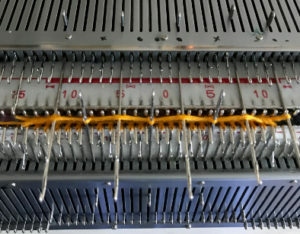 As in hand tech, transfers and multiple loop containing needles are brought out to hold before moving the carriages from left to right and selecting the needles for the next set of floats with that same pass. 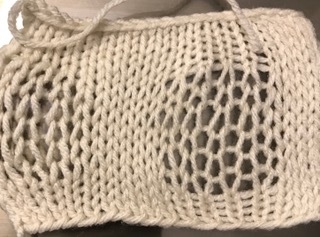 I was written an email asking about the possibility of creating bubbles in hand knitting, this is my attempt, may serve as a starting point for DIY. Below a small sample serves as illustration of my first attempt. It was knit in acrylic, steamed to the point of death, but shows the type of elongation of the “bubble” stitches using this technique. To keep things simple I stuck to a “square” shape. 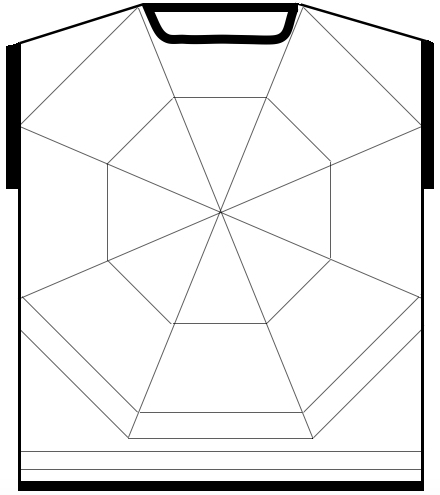 Stitch counts and placements of shapes may be adjusted to suit. 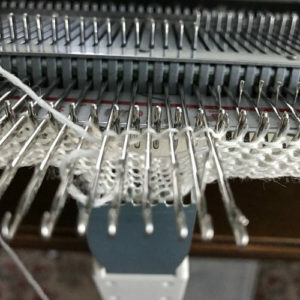 It is possible to knit or purl the yarn overs, unraveling the extra stitches before knitting the original number of stitches when the top of the bubble is reached, but the resulting look is a bit different. 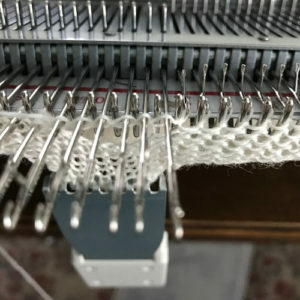 It is worth trying, depending on preference for type of result, or the way one is accustomed to dealing with elongated stitches and yarn overs in hand knitting. 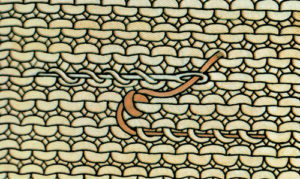 The further step of taking the technique to a brick repeat follows. I have been experimenting with a varied number of rows and stitches. 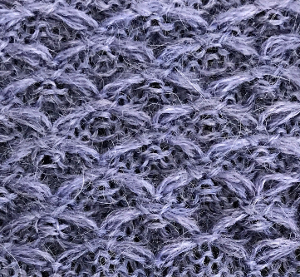 Subsequently I was happier with knitting or purling the yarn over as an extra stitch/ increase until I had worked the desired number of rows, then dropping those extra stitches, thus working once again on the original number cast on. The shape also seemed a little less square to me if a second row was worked before returning to making yarn overs. 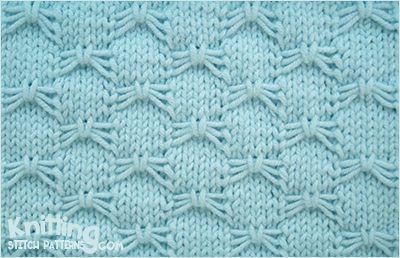 A border of more than one stitch on either side helps stabilize the shape edges. This sample was worked in my “throw away” acrylic 4 ply. 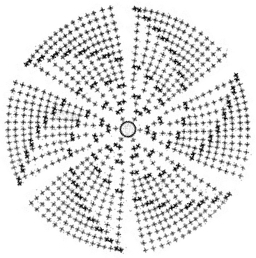 To my eye the most pleasing and effective bubble happened on the least number of rows of dropped stitches (diagram provided above). 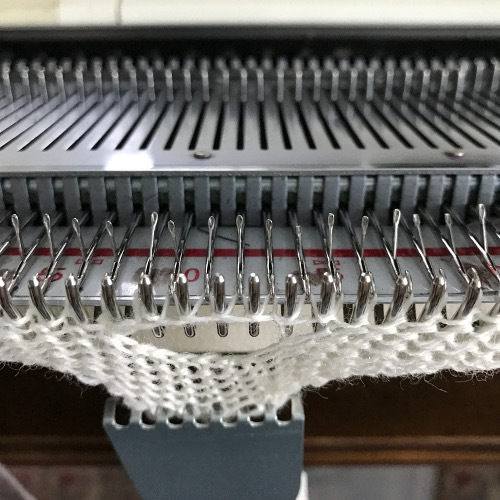 The top and bottom edge of the “bubble” looked the best when stitches were taken off the needle on one row, and not allowed to “run” to the yarn over row until after the next row was knitted or purled all the way across. That may not be the best idea, especially when working much wider pieces of knit. Dropping back to yarn over row as you work row 6, 13, etc. 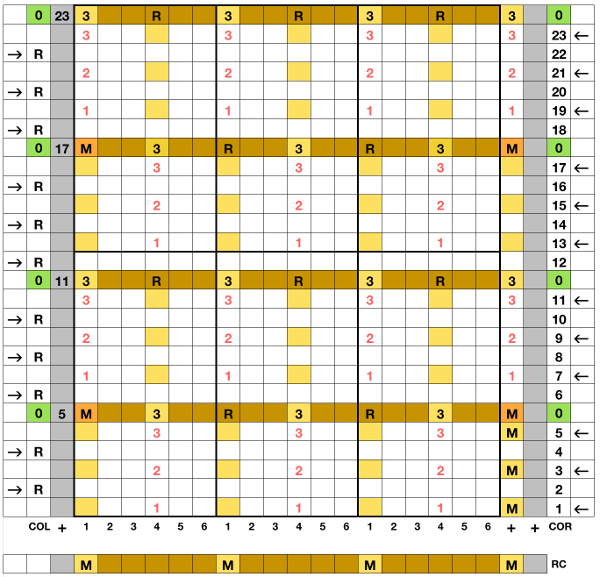 of chart provides a more controlled way of checking “runs” for individual stitches, making repairs for any errors easier. 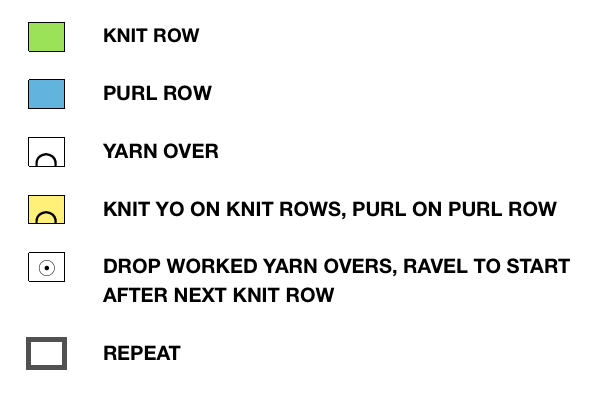 Dropping yarn overs with each pass seems to me to be the easiest way to track knitting as it progresses or gets wider, and counting bubble rows is far more easily tracked. 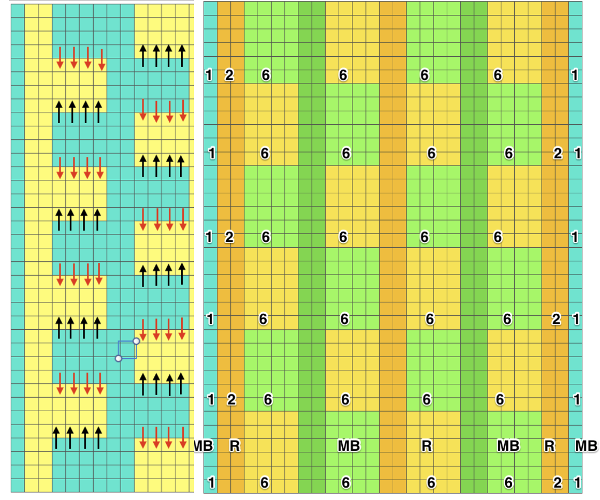 Below, variation #5 matches the above chart. 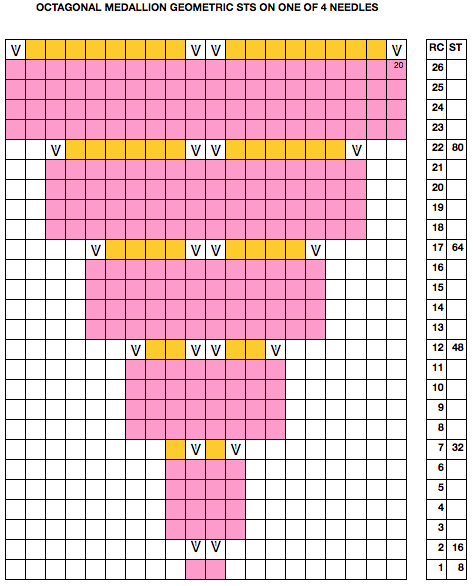 A last swatch: here a row is knit or purled as seen in chart above, after yarn overs and their treatment is completed. 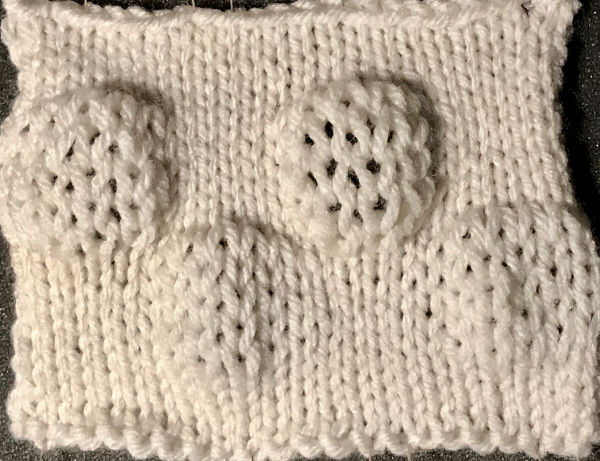 If the aim is bubbles which will not be flattened out, dropping the yarn overs on each row worked gives a flatter (bottom of swatch), less of a “bubble” effect than knitting or purling the yarn over before dropping it at the appropriate point (top of swatch). If the fabric is to be “killed” as flat as possible, dropping the yarn overs each row may be good enough. 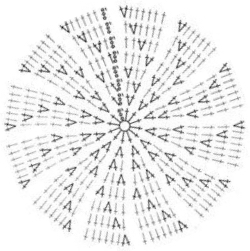 I have gotten used to seeing charts for crochet in the round, and prefer charts to written instructions in knitting as well. My hand knitting has usually been project oriented in terms of experimentation or exploration. Reviewing information provided by both Zimmermann and Thomas in their early publications has led me to new appreciation and admiration for their efforts and for the knowledge made available to their readers, and not just in their time. 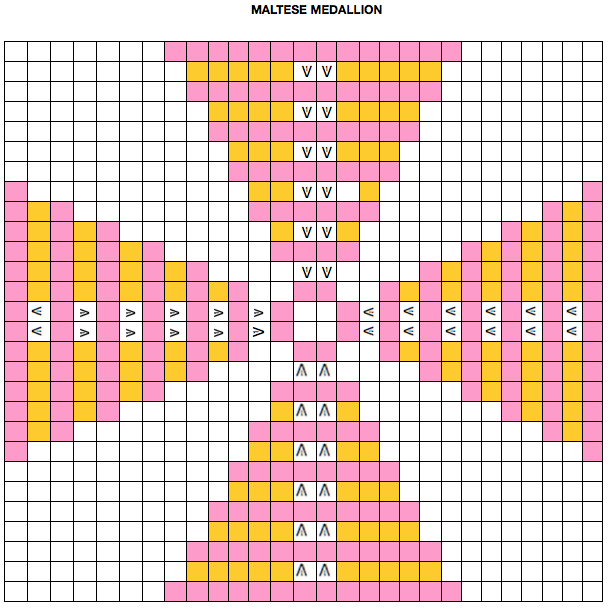 Looking at the additional medallions by Mary Thomas, I thought I would play with attempting to illustrate them, some in rounds rather than individual wedges lining up flat with blank or greyed out squares between them. 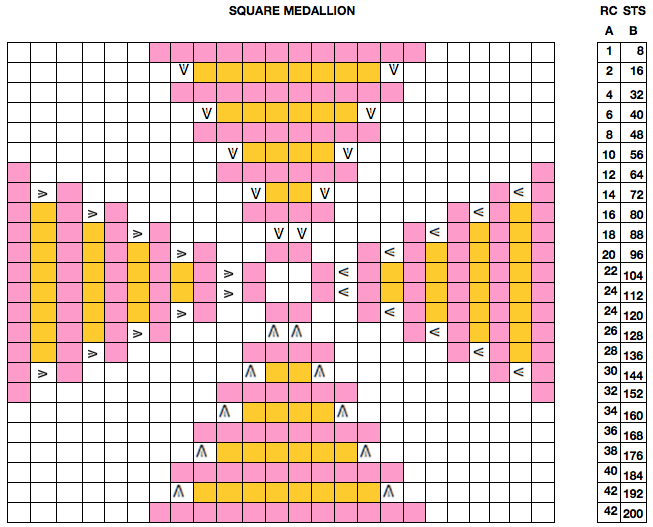 The first example is my imagined square medallion (straight, geometric), p. 239 in my Dover edition 1972, and created in Excel. The work is begun on 8 stitches, divided evenly among 4 needles, knitting with a fifth. 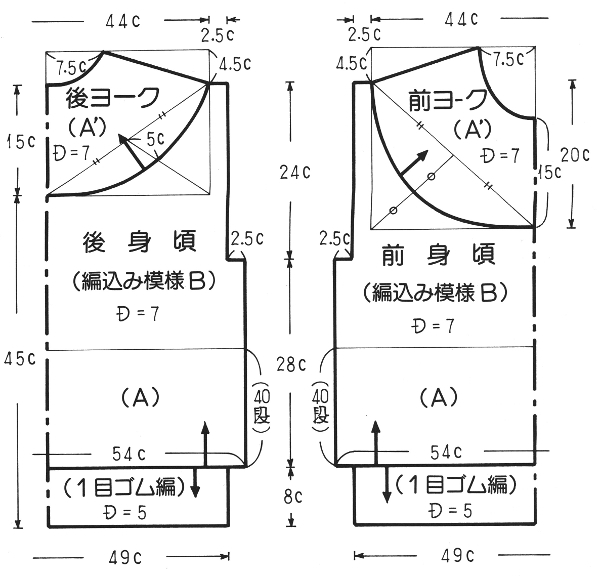 The cast on is equal to double the number of sides of the square geometric shape, 4. 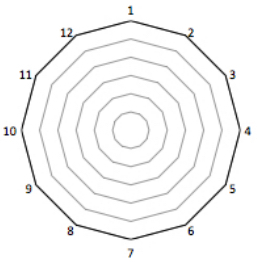 A hexagon would begin with 12 (6X2), an octagon with 16 (8X2). In this instance the increases are arranged at the beginning and end of stitches on every needle. 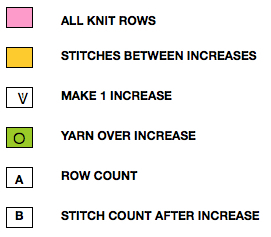 When compiling information on machine knitting, I generally swatch to proof ideas. I am not planning on making accompanying samples or swatches for these. 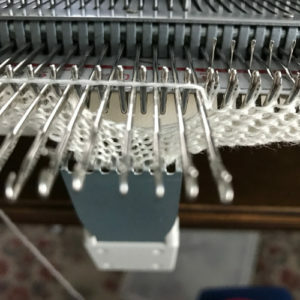 I knit primarily on the machine, and prefer hand knitting on long straight needles as opposed to rounds, so I find myself often referring to counts as rows rather than rounds. 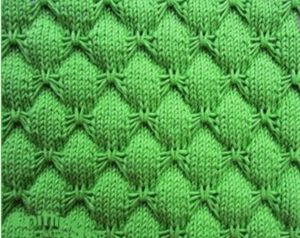 For square medallions cast on 8 stitches, divided on 4 needles, knitting with a fifth. In all patterns after cast on row is divided, first round is knit in back of all stitches to flatten them. 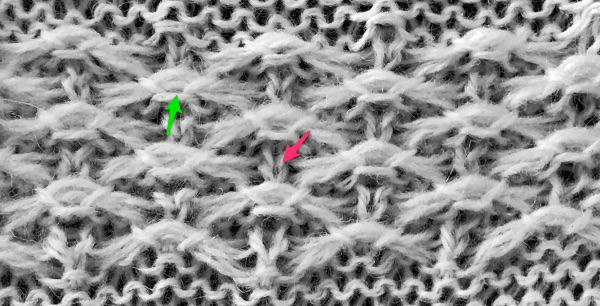 Stitch counts after increases sorted high to low are helpful when knitting from the outside edge in, and in that instance they become decreases. For the square medallions they are shown in that order, with counts for many more rounds than those in the illustrations. 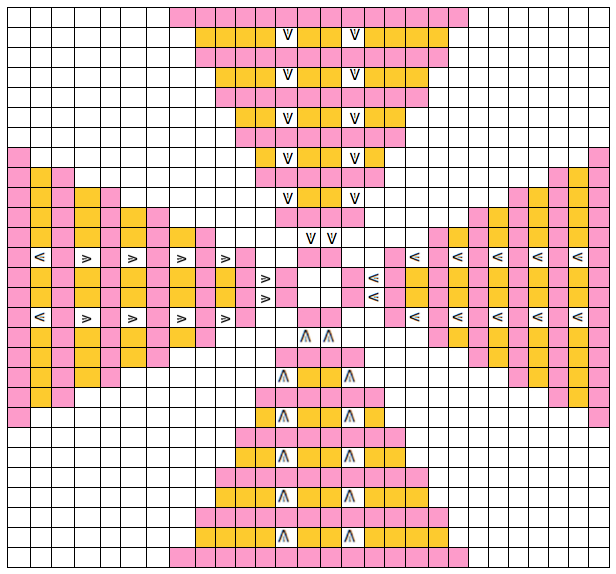 Beginning with the pentagon, they reflect stitch counts from the start of each segment shown. The hexagonal medallion swirl (p. 243) is shown using both M1 and YO increases. 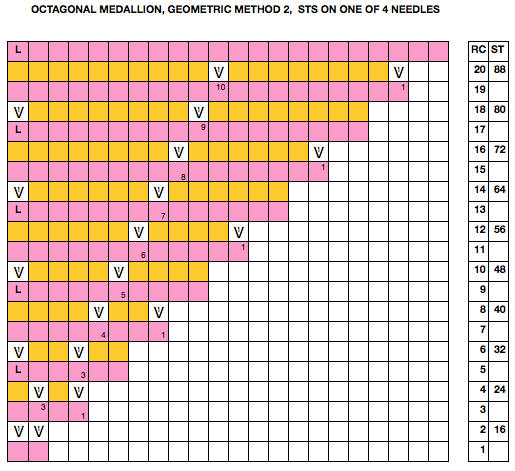 Here the rate of increase in rounds is slower than above (2 per needle as opposed to 4), so increase rounds are separated by only one row knit The octagonal medallions (pp.244-245) are cast on 16 stitches, divided on 4 needles and knit with a fifth. 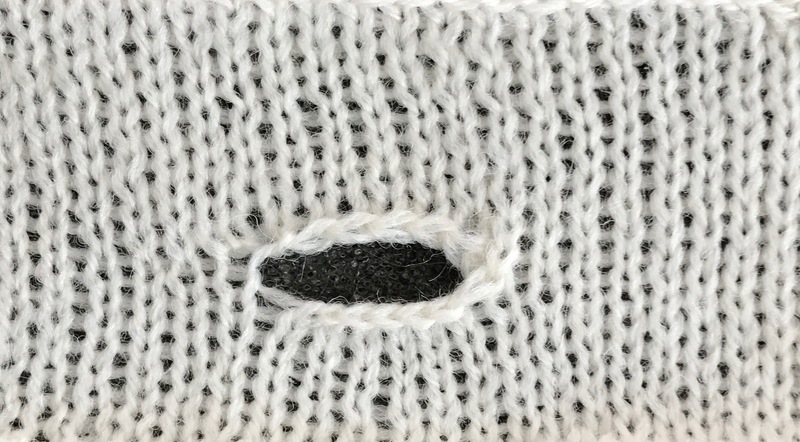 To make a smaller center hole, 8 stitches may be cast on, doubled on the next round, and then divided. 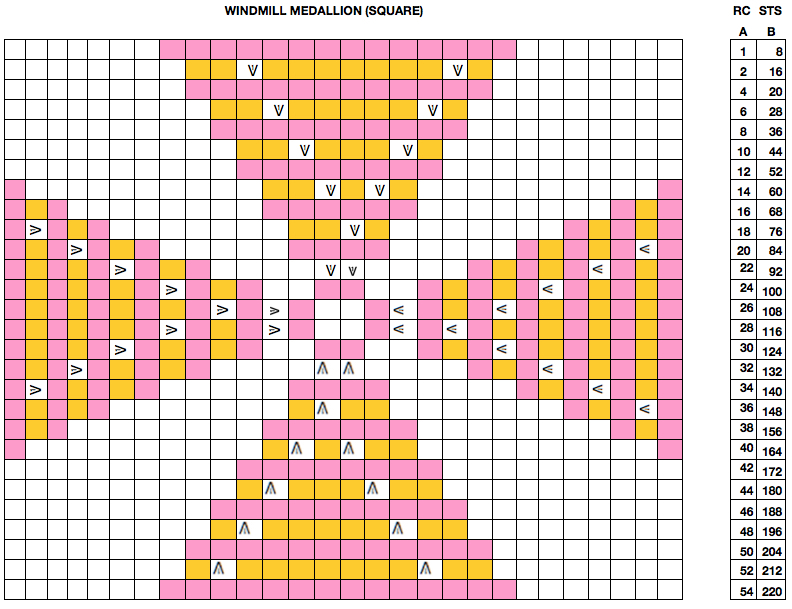 The first geometric medallion shows increases (4 per segment, 16 per round) in single rounds, requiring several knitting rounds between the increases. 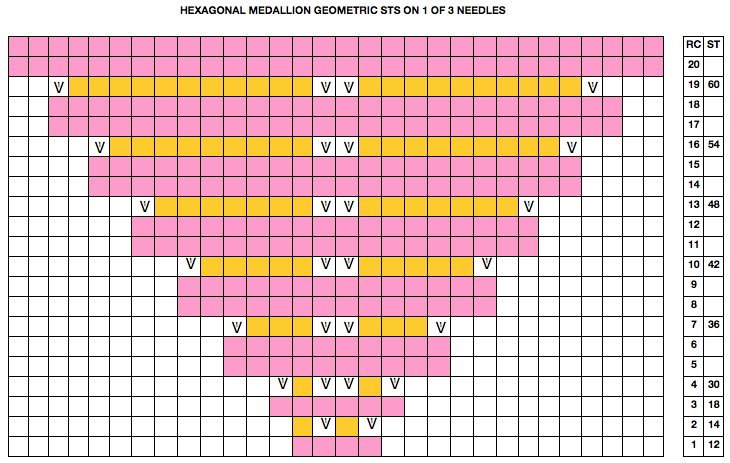 The second medallion uses more frequently (2 per segment, 8 per round), so single all knit rows separate rounds For the octagonal medallion swirl (p.245) directions are the same as for the hexagonal one, with a 4th segment providing extra sides If the perimeter or circumference of the shape to be knit are known, the process may be reversed from the edge in, with decreases replacing increases. The advantage to working from the center out is that adjustments i.e. 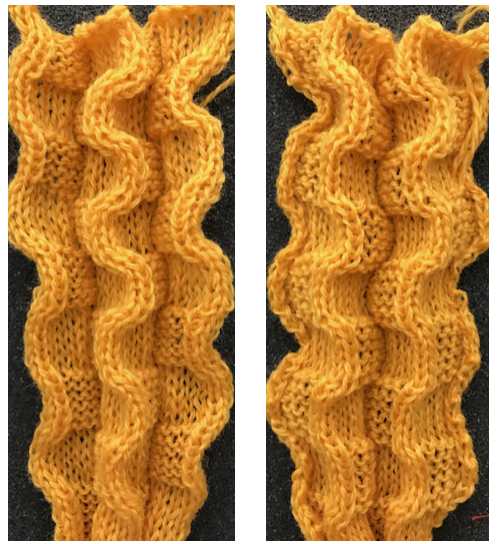 extra knit rows between increases, changing increases to yarn over(s) for added ease or decoration, etc. may be made far more easily as the work grows. 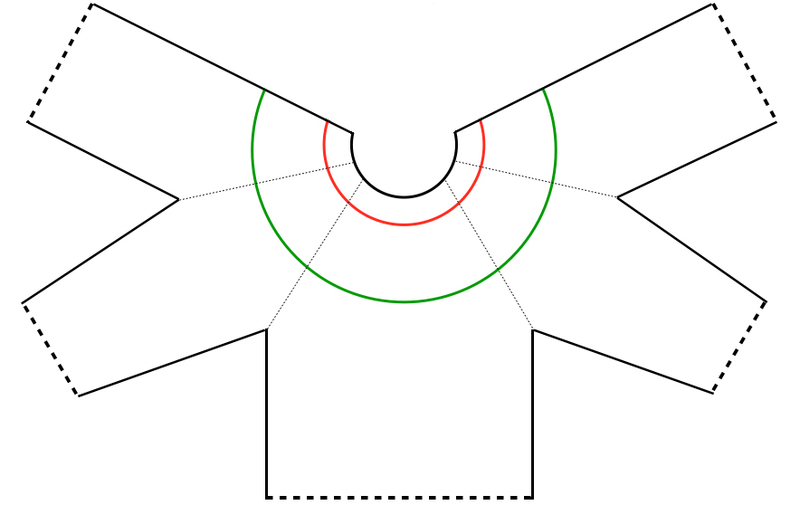 Considerations should be given to leans of M1 stitches so they point in opposite directions on alternating sides. 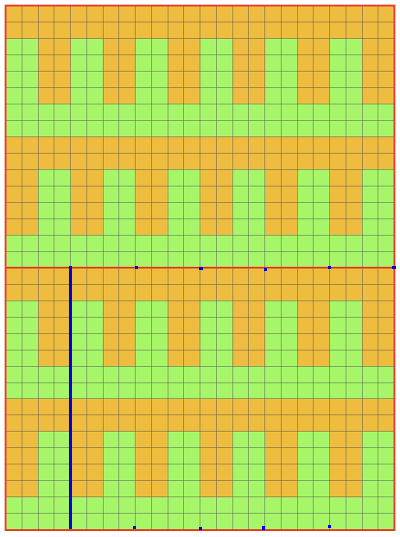 Motif and pattern placement can only be planned after these building units have been sorted out. 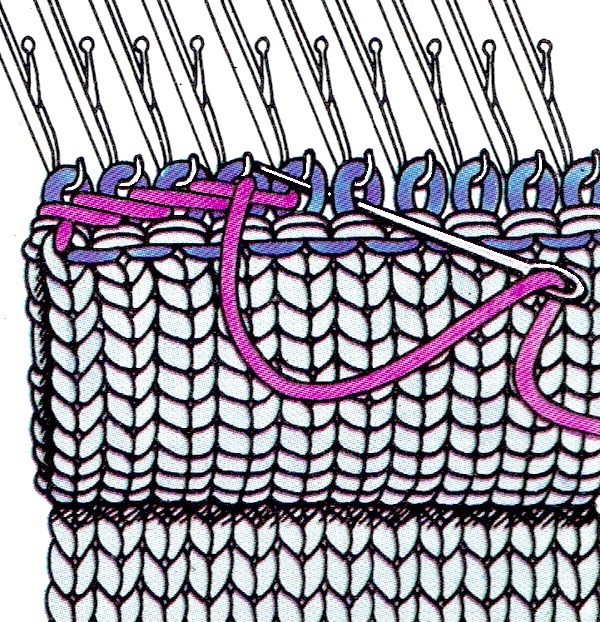 Elizabeth Zimmermann provided guidelines for circular shawls in her books and publications, including “Knitting Workshop”. For a basic pi shawl (p. 112, Schoolhouse Press, 1984) the assumption is that each section is twice as deep as the previous section and has twice as many stitches. 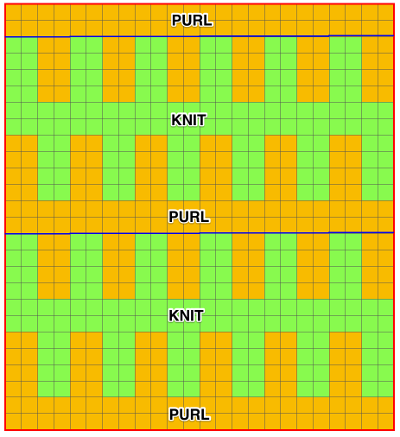 Below CO row represents cast on stitches if the work is to begin from the center out, Column A the row count on which the increases take place, column B the number of rows knit just prior to increase row (A-1), and C the number of rows available for any planned repeat (A-2), thse are constants. 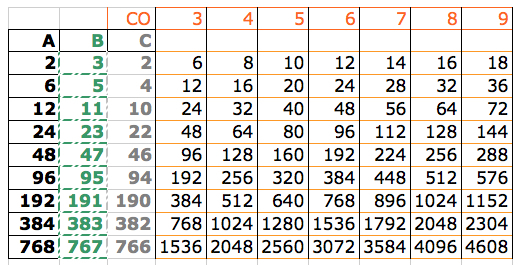 The columns directly below each cast on (CO) number (orange) counts represent the number of stitches when increases are complete. The stitch count doubles when the number of rounds has doubled. 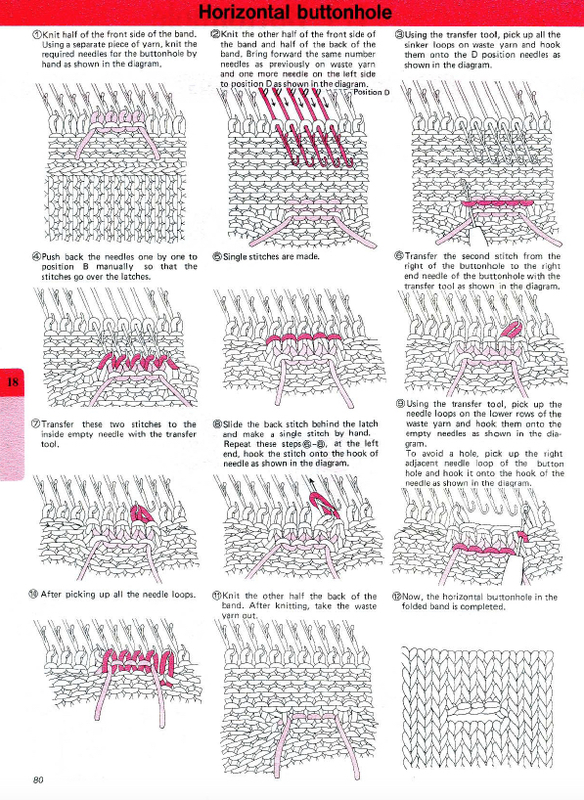 Mary Thomas’s Book of Knitting Patterns, Dover 1972, p.p. 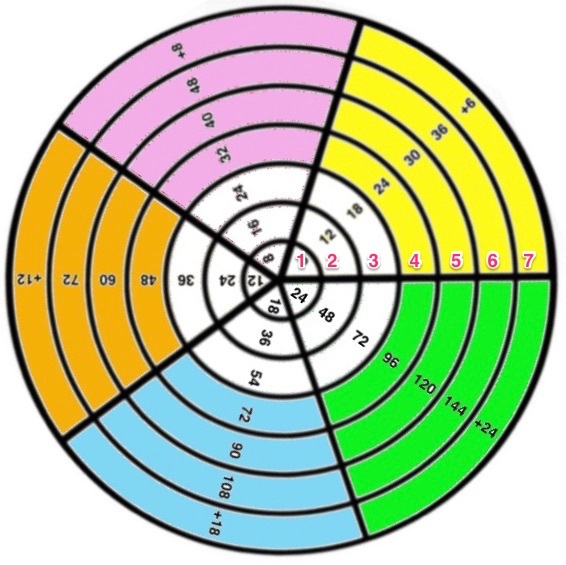 245-247 provides guidelines for circular medallions. She calls her first a “disc” medallion. 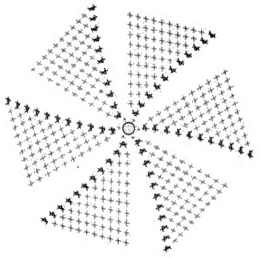 In executing it the aim is to scatter increases so they are less visible and do not form spokes. 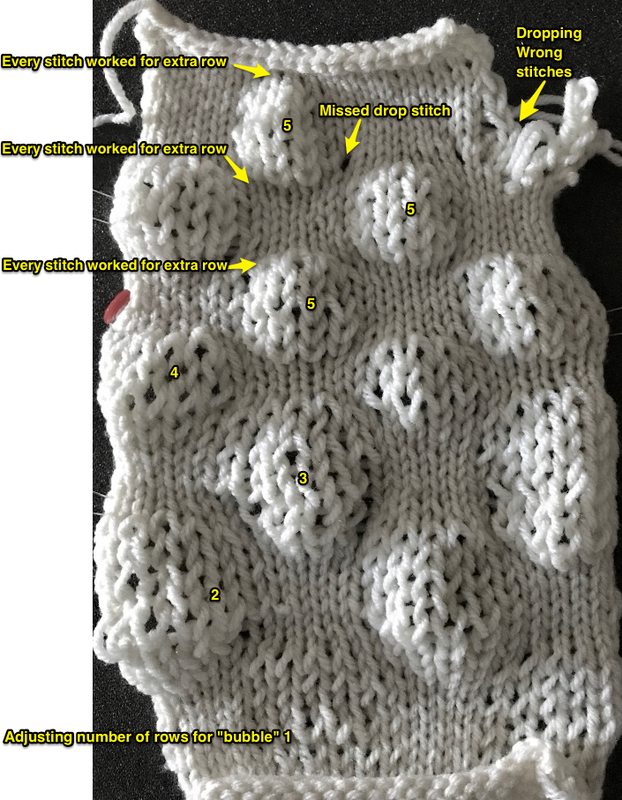 Four stitches are cast on, with 4 stitches increased in the total count every other row. 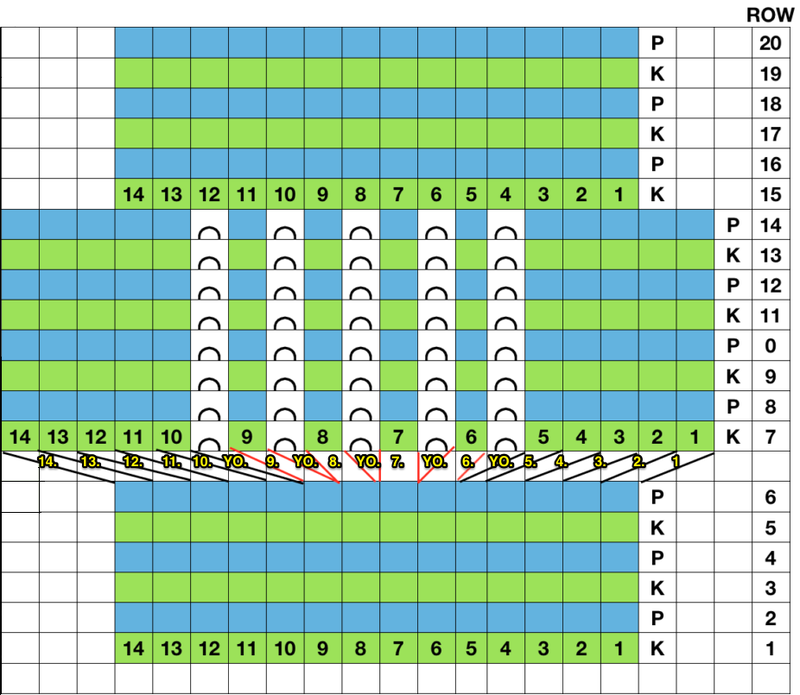 The number of stitches between M1s increases by one on every other row. 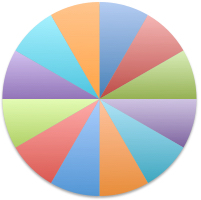 My chart happens to read from left to right. 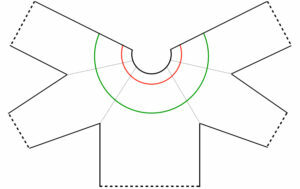 As with any knitting in the round, the process may be reversed, starting at the circumference and moving toward center. 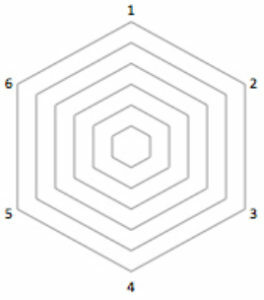 I personally like charts to help visualize results, and have revised her counts in the illustration below so increases are at the same rate, but placed a bit differently within the rows. 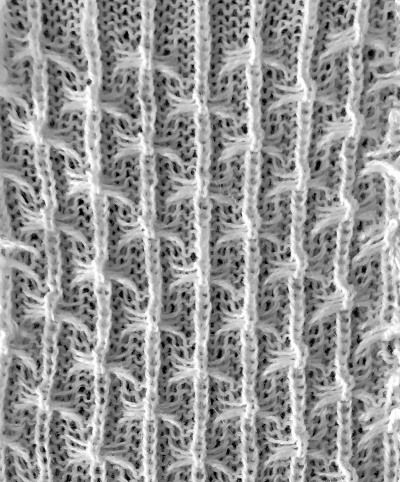 On rows with even numbers between decreases, start row with half that number of knit stitches before the first increase. 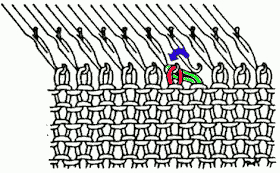 Because one is knitting in the round, with knit side facing, all rows are knit. 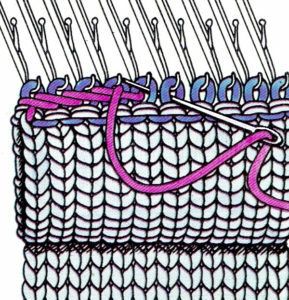 If the work were knit on 2 needles, knitting every row would produce garter stitch. 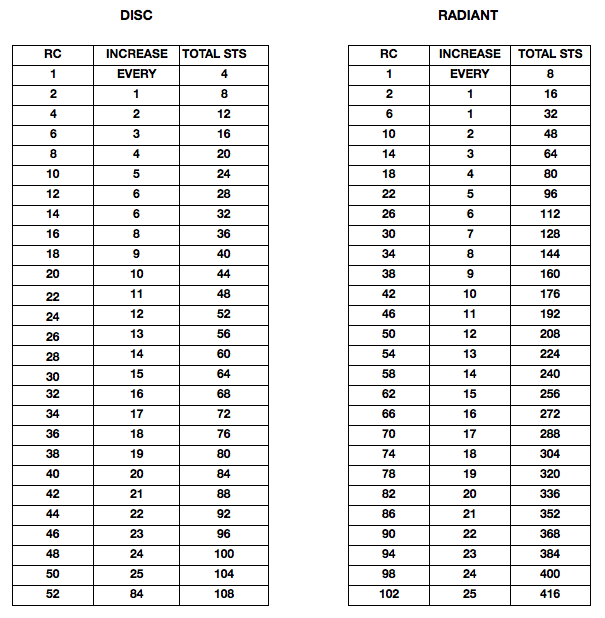 what happens if increases “line up” For her circular “radiant” medallion after the first 2 rows increases are made every 4th round. 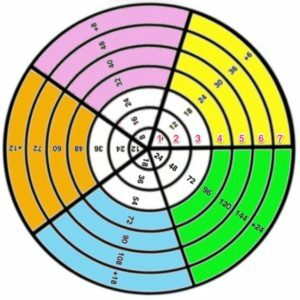 My chart is renumbered excluding the first 2 rows, so the increase rounds would occur on numbers divisible by 4, making it easier for tracking them. 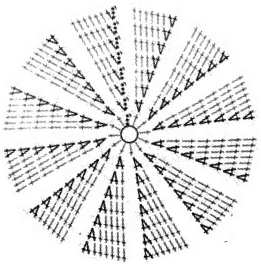 Each “building” round increases the number of stitches by 16. 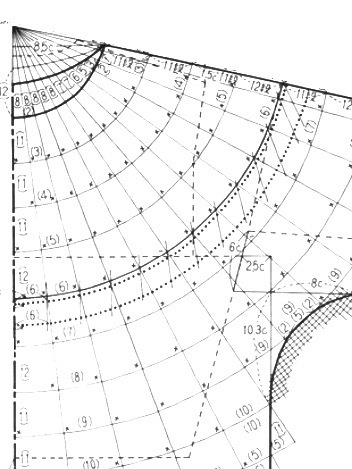 These formulas do not take into account changes in gauge, or stitch type within bands. 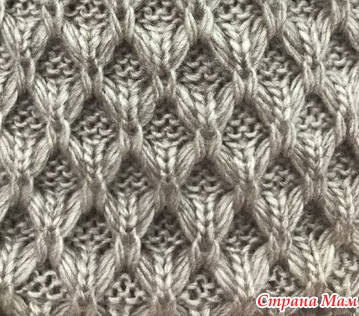 For similar shapes to be achieved in machine knitting, the number of transfers would be prohibitive. 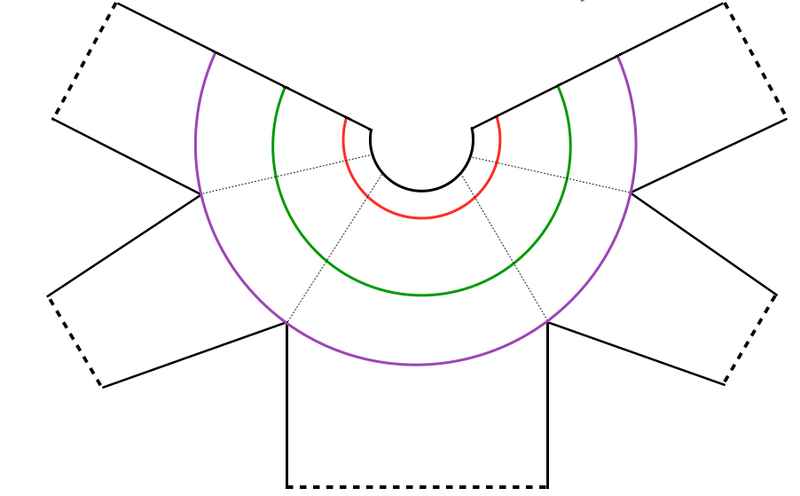 In order to achieve similar shapes one begins with the radius of the finished circle and the shapes in the family may be knit sideways, using holding. Handknitters can work with 4 double pointed needles, one or 2 (or more) circular needles, and crocheters can follow similar shaping methods. The advantage to long circulars is less bunching up as the work grows, and if you like working flat or want to try the garment on while shaping it, you can use more than one long needle, making the piece or the try on manageable. Working from the top down when knitting such shapes may give one more control over the size of the finished piece i.e.. on length of body and sleeves, height between bands, extending a yoke into a shoulderette or cape. 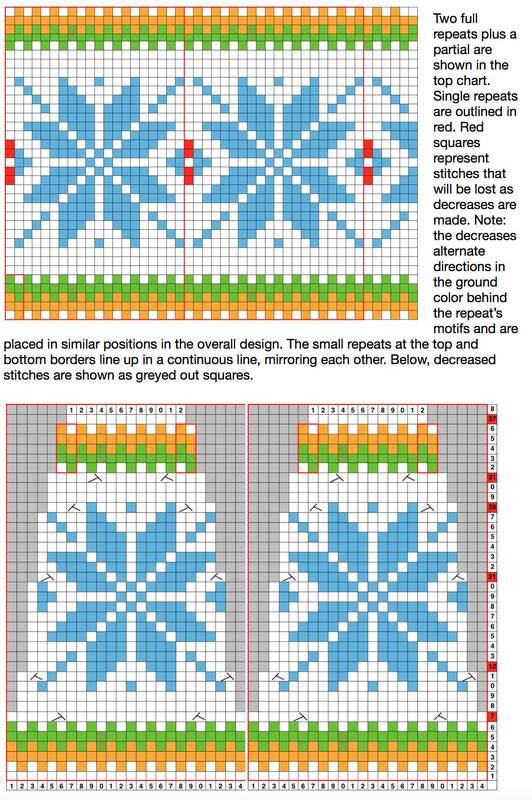 Stitch pattern size and repeats add to the math calculations. 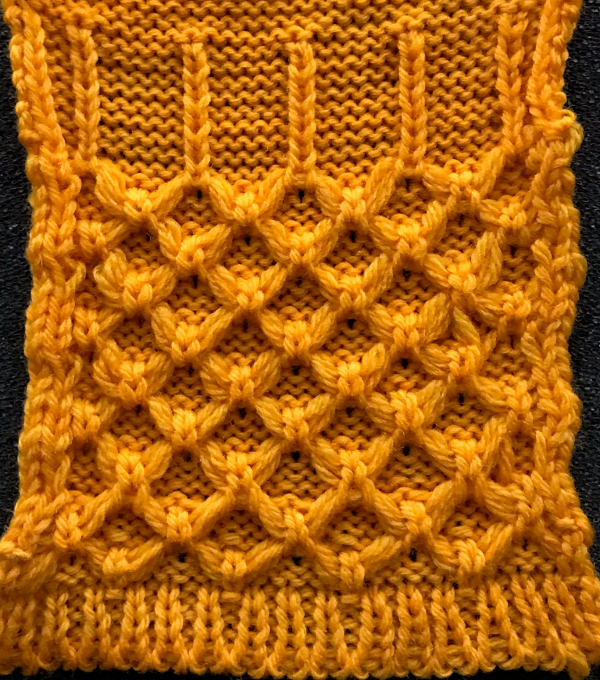 Garter stitch is the only hand knit stitch that approaches a square gauge, could be used in combination with patterned bands. The charted patterns above rely on M1 to increases. 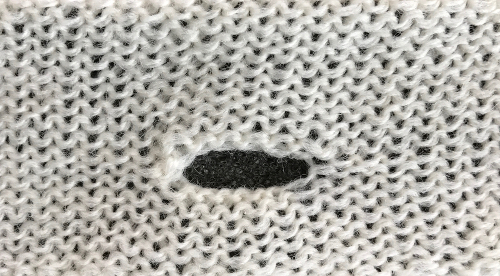 Yarn overs may be used for decorative holes at increase points. 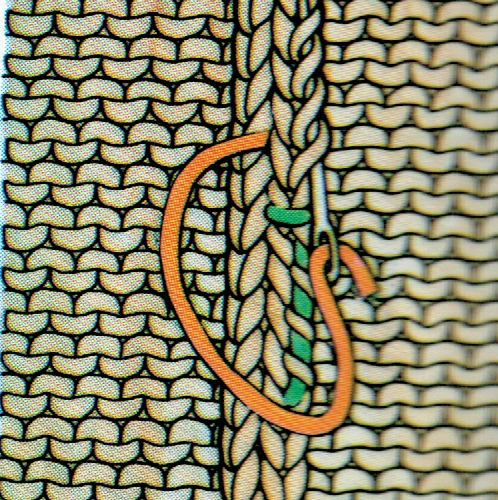 If preferred, the hole may be diminished by twisting the stitch when picking it up on the next round. http://techknitting.blogspot.com/2011/03/jogless-stripes-pretty-picture-version.html. 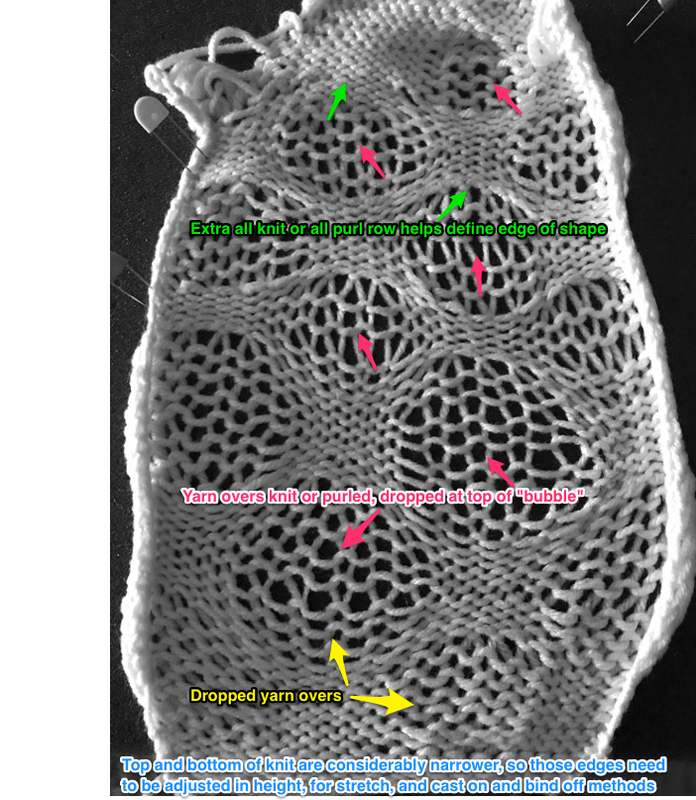 For a method using yarn ends and a needle when yarn is cut http://imgur.com/a/NREsH. 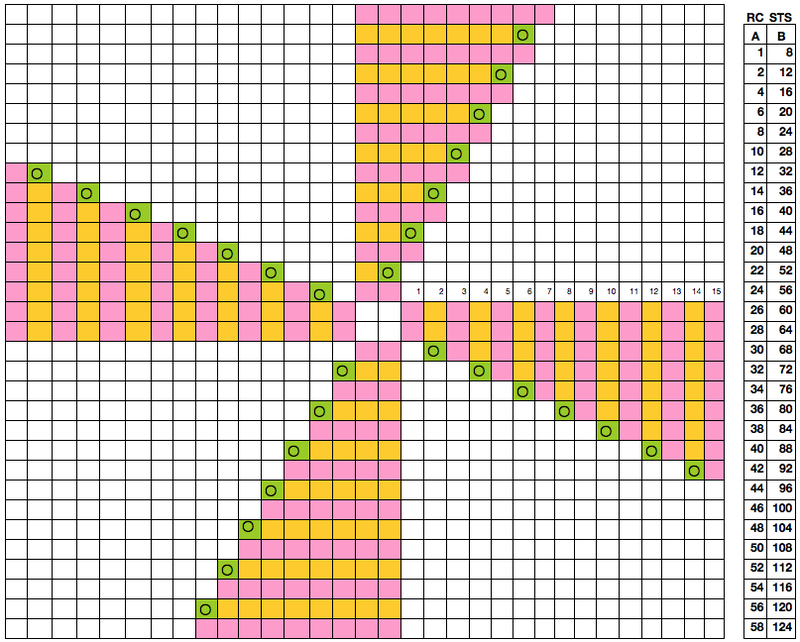 For shawl shapes and their geometry using YO increases, see the posts and publications by Holly Chayes. To start it all from center out: I am used to doing the magic loop cast on with a crochet hook, and then moving on from there, Kitty Falol shows it worked with DPNs. Just as other knitwear styles have varied in style, ease and fit over the years, round yoke sweaters have also done so. 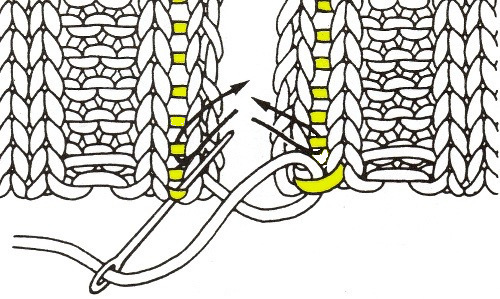 Yokes can be wide or narrow, in patterned or textured stitches, and in varied proximity to the neckline. This is not generally a tailored style. Ease in knits can be calculated on the basis of fashion or personal preference. With some familiarity with slopers measurements may however, be adjusted in this style as in any other sweater. 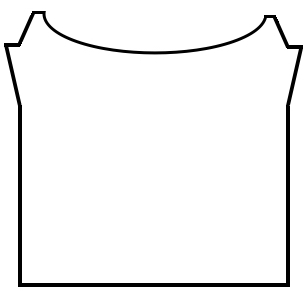 Neckline measurements do not reflect the measurements achieved after adding finishes i.e. turtle or round. 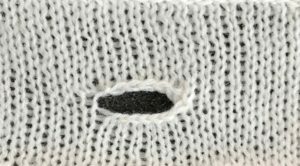 Depending on the size of the yoke, shaping can begin at the armhole level bind off (seen in the early hand knitting directions in the 70s), while smaller yoke shaping can begin at whatever point is desired, extending to the neckline, or simply to create a design band. 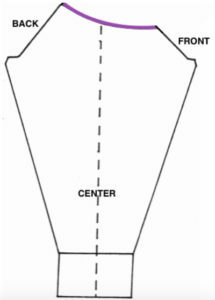 The shaping is created by decreases if the garment is knit from the bottom up, and with increases if worked from the top down. 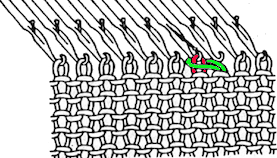 In most styles the same number of rows are worked from the armhole bind off or held section to where yoke sections meet. 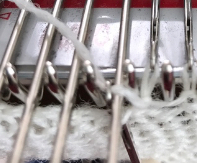 At that point if hand knitting on circulars the 4 sections: i.e. left sleeve, front yoke, right sleeve, and back yoke may be picked up and joined for completing the yoke. My illustrations have been created using Mac’s Pages lines and shapes. They are not to scale. 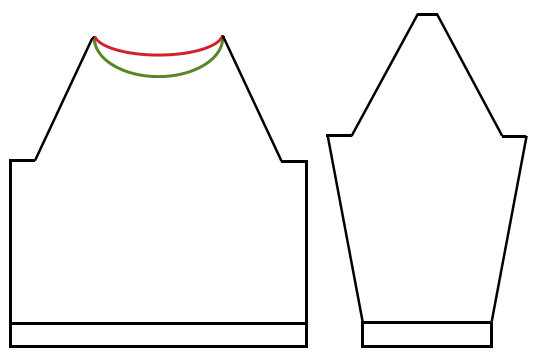 Other authors suggest 1/4 of total body and sleeve measurement in stitches (excluding armhole) for a tighter neckline (turtle neck), one third for a more open style (crewneck). Original circumference/ body measurement should include any ease. 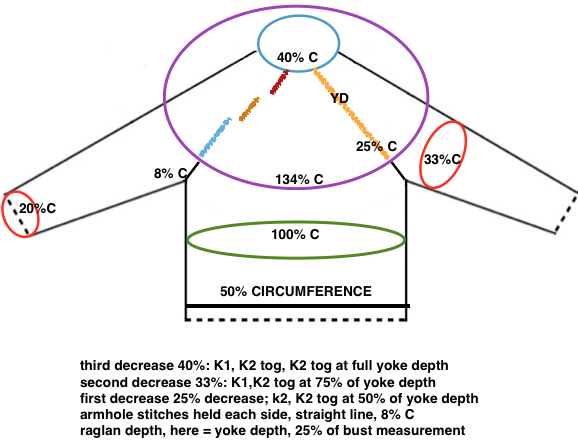 Though decreases for the yoke: first halfway up 25%(one out of every 4), second 3/4 up 33% (one out of every 3), and last 1/2 inch before full depth is reached 40% (two out of every 5) are the most common, they can be placed and varied to suit your own design. 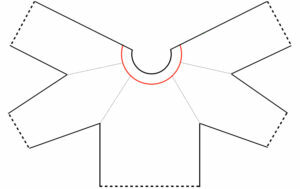 In drafting your own patterns and partnering with someone, a tape measure or string can be laid on shoulder line, etc. for an idea as to preferred placement and measurement. 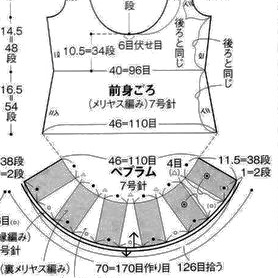 Necklines finished by bound off stitches whether machine or hand knit, do not stretch, so measuring your head with something that does not as well gives you a guideline. 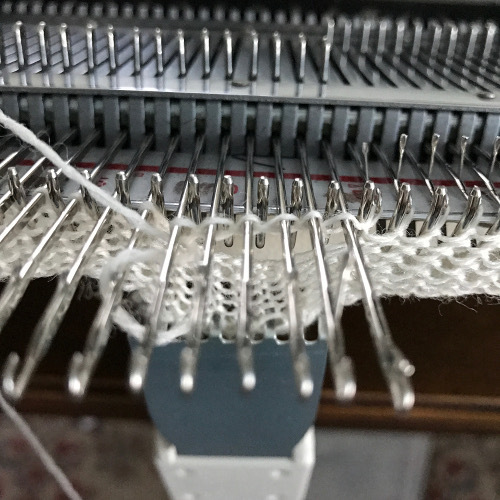 Yokes end in open stitches, so the thing to consider there is what method is used to finish the neckline, and its own stretch factor after bind off. Hand knitters have the added benefit of splitting the work on 2 circulars and trying on the sweater or its pieces on while in progress to double check fit. 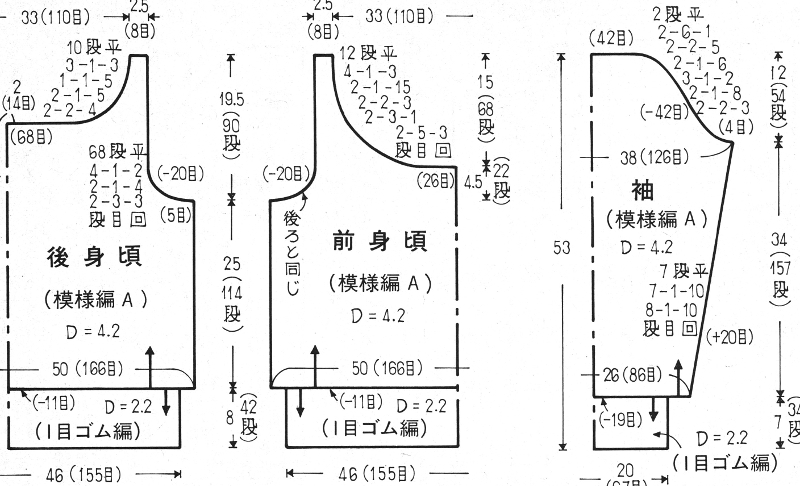 Japanese designers began to publish patterns that often included yokes that were constructed on the top of the drop shoulder line, with the back yoke placed higher than on the front. Such yokes also began to be represented in stepped figures showing decreases. In the round calculations are gauge based, not relying on the pi formula. 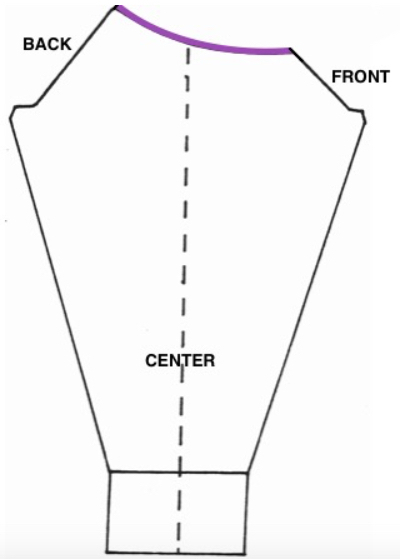 Yoke shaping may be indicated in stacked format. The final count and frequency of decreases is shown, publishers may vary in language. 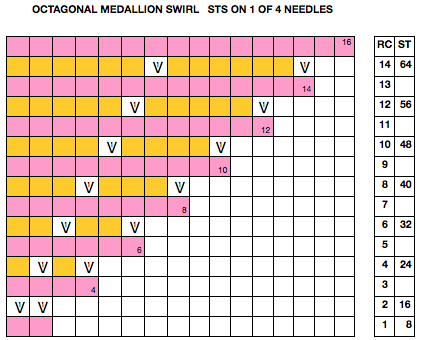 On the first row here 4 sts – 2X means there is a group of 4 stitches followed by a decrease 2 times, then 5 stitches followed by a decrease 23 times, etc. Two online calculators are available to help with DIY: 1. the Yoke-U-Lator, and 2. for Lopi, Icelandic styles. 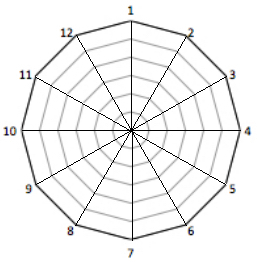 The image below is a screenshot from the latter website, indicating a sample possible result. There had been issues with silverlight not working in some late OS updates, making the site unusable for many. On 3/12/18 after installing the latest update for the plugin from Microsoft, I was able to run it using both Safari and Firefox respectively. 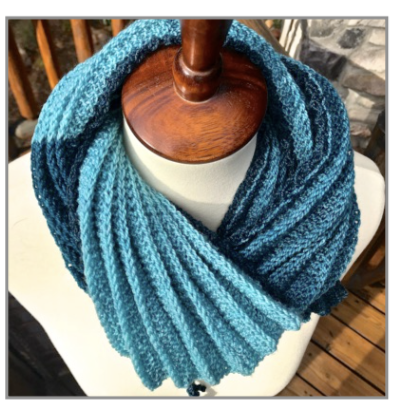 Jessica Tromp offers free circular knitting patterns with round yoke, dimensions in inches and ounces. 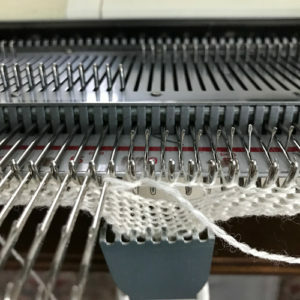 “Decreases” in rib sometimes can be achieved through changes in needle size if hand knitting, or tension changes on the machine. 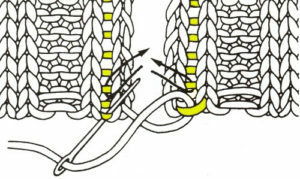 The yoke in machine knitting would need to be split in 2 parts or knit sideways. 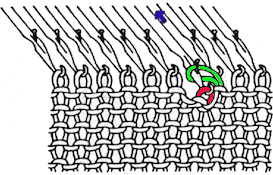 Plain colored rows between bands of FI may appear noticeably lighter in weight, so using a 1X1 one color FI pattern or double strand of one of the pattern colors may improve the look. 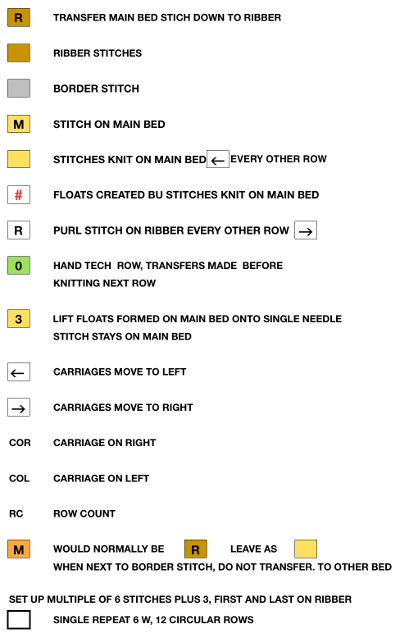 Before transferring stitches on the machine in the single color rows, make your transfers. 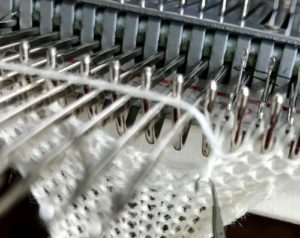 The lace carriage may be used after selecting appropriate needles and putting them in position. 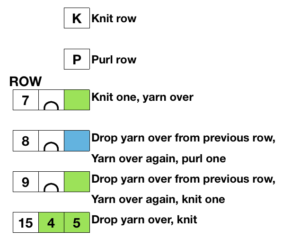 Knit the following row before removing knitting on waste yarn or garter bar. 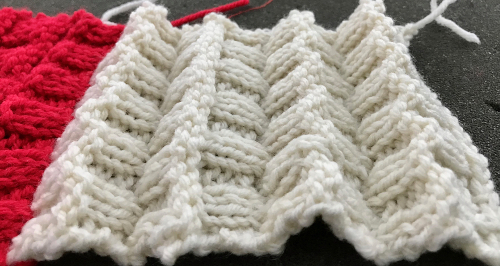 If stitches are tight for garter bar use sometimes the row after transfers may be knit at a looser tension to facilitate the process, and the difference may not be noticeable when knitting at “normal tension” is resumed. The carriage should be set to plain knit for row prior to and after transfers. 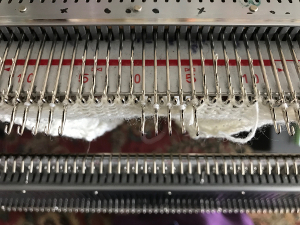 It may be easier to work toward the center from each side when returning stitches to the needle bed. 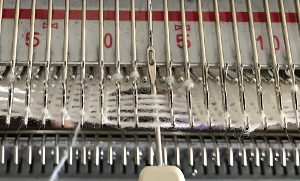 In order to match the pattern at the shoulder seams or when motifs need to stack in position on separate bands, the stitches need to be rehung at specific positions on the needle bed that take into consideration the size of the repeat and its location within the stitch count. 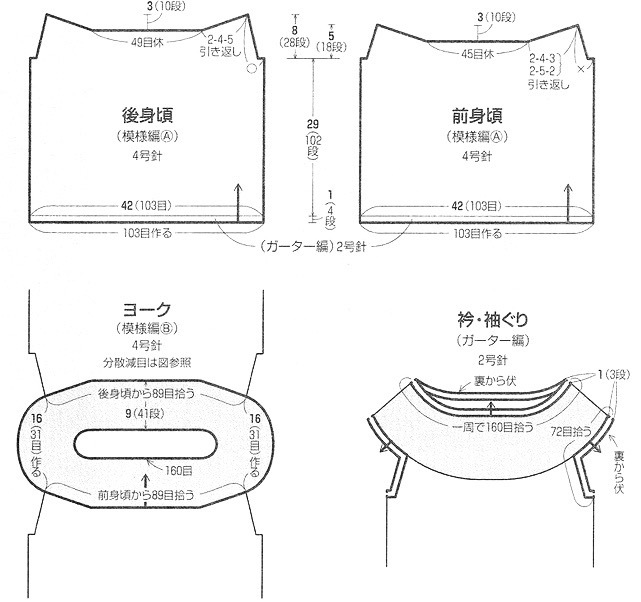 Also, take into account the seam allowance. 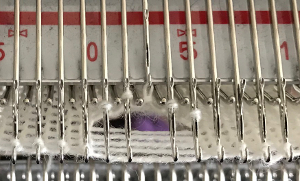 One stitch extra on each of the meeting seam sides will allow the end needle selection stitch or an extra patterning needle to be hidden within a full stitch join. 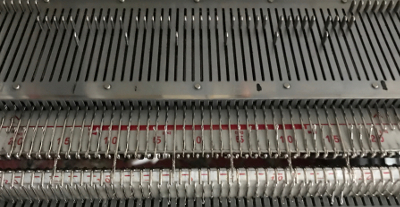 Working on machines that preselect needles or pushers makes tracking a bit easier. 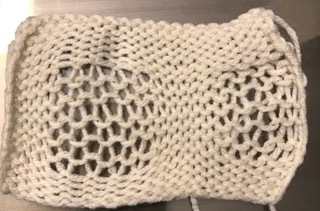 It is possible to combine knitting pieces in both directions. 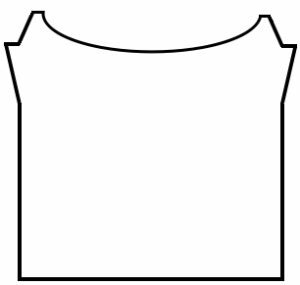 For example, knit yoke up toward neck, join shoulders, and then pick up appropriate stitches to knit body and sleeves from the top down. Top down makes any adjustments in length easier prior to finishing the sweater. Short rowing in garment segments underneath the yokes makes for a better fit at bust line and upper back. 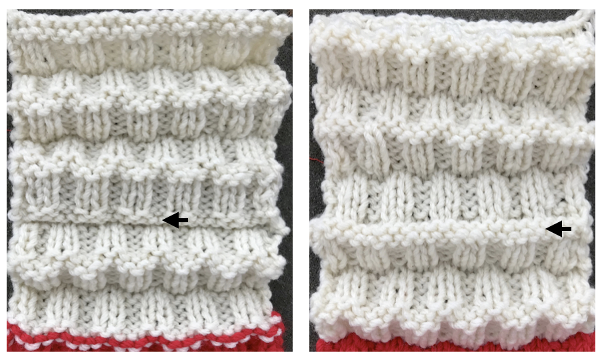 I began a series of posts on miters and spirals created on the knitting machine back in 2011. 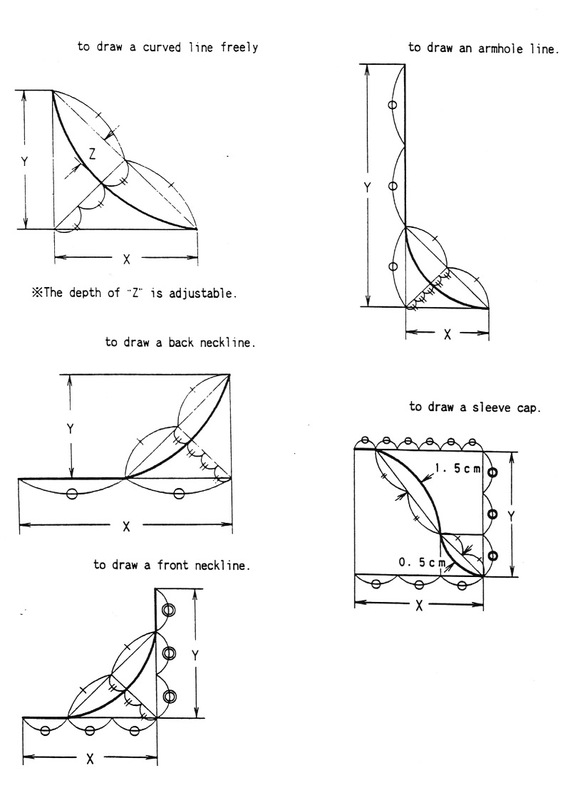 The oldest posts, 1, 2, and 3 begin to address creating flat circles in machine knitting using holding techniques. 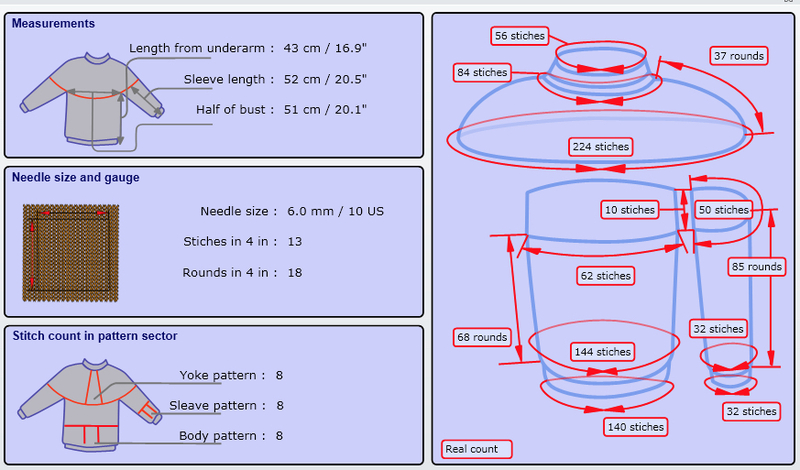 Hand knitting in circular format and crochet share some similarities. 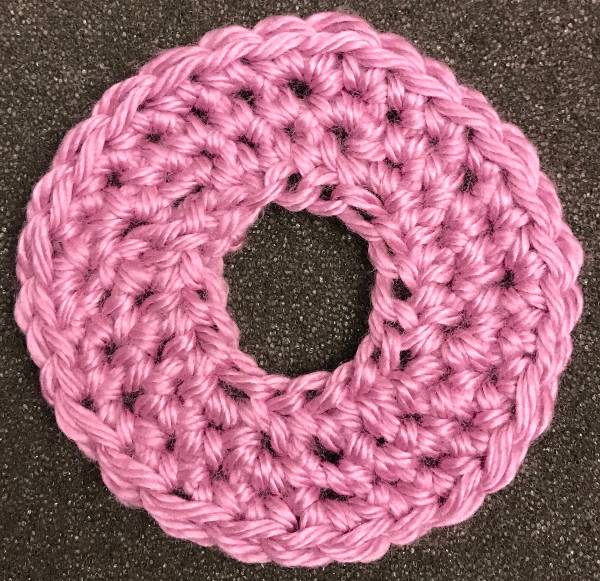 There are 2 methods of constructing circular work in crochet. 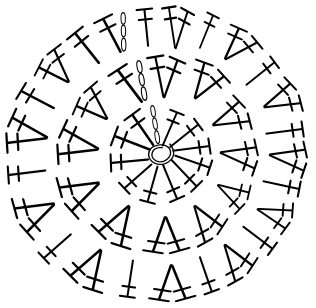 1: in rounds, (akin to knit miters in shape) where the end of each circular row is joined up to its own beginning to form a ring. A new starting chain (s) is formed to take the row up to the proper height for the next row to remain constant. 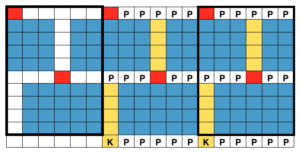 Depending on the pattern, one has the option of continuing by turning the work or not at the end of each row. 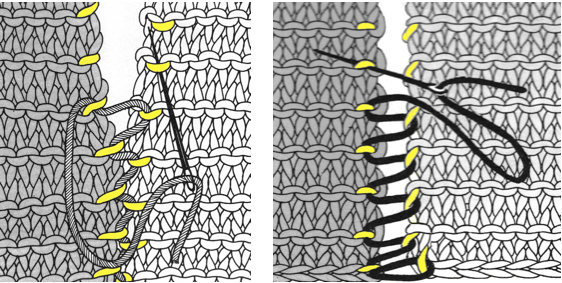 Doing so allows the opportunity of altering textures and working in the fronts or backs of stitches. 2: in spirals. 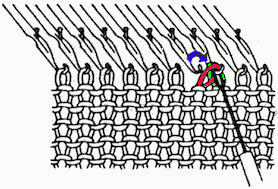 Rather than joining the ring, one continues on by going into the tops of the posts in the previous row. 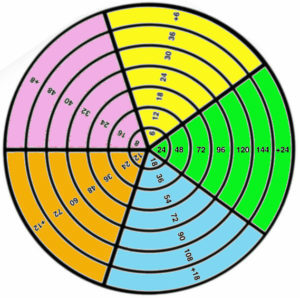 With spirals it is useful to mark the beginning of each round. Knitting markers shaped like safety pins are handy for that purpose. 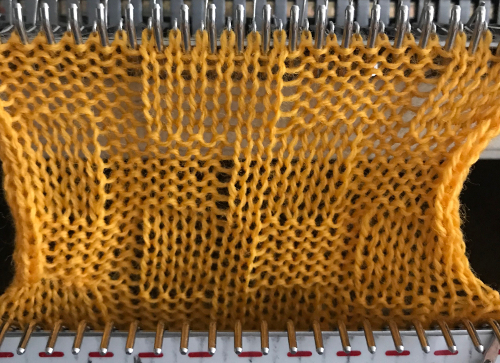 A line of contrasting color can also be created using a separate strand of yarn and alternating carrying it back or to the front prior to forming the first stitch in the new row. 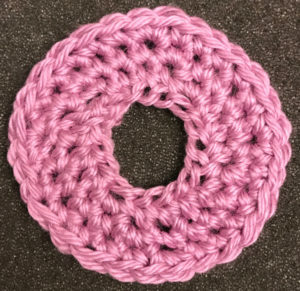 As with knitting, crocheted circles are not true circles, but rather, they are polygons. 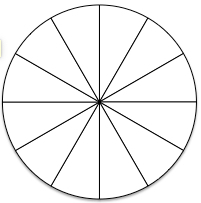 The way to make shapes more circular is to scramble the increase points, putting them in different starting positions in each round (always spacing them equally and keeping the formula). 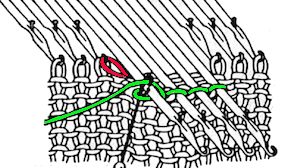 Within limits one may make the starting number of stitches in the first round a multiple of the number of segments in the finished shape. 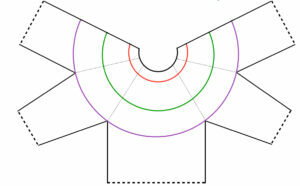 With the creation of a flat circle in mind, the number of stitches needed depends on the height of the stitch. 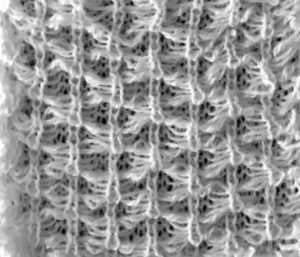 The taller the stitch, the greater the number of stitches required. 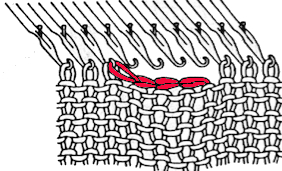 If the stitch stays the same throughout, the number of stitches added on each round is constant. 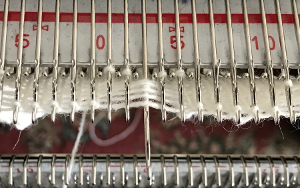 Test work regularly at intervals as the work grows by placing it on a firm, flat surface, to see if working only one stitch into each stitch is required / enough at that point to maintain the shape. 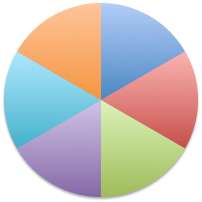 The more segments, the smoother the circumference. 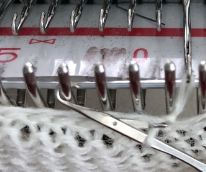 Unlike in hand knitting, the first loop on the hook does not count as a stitch until you make it into something. 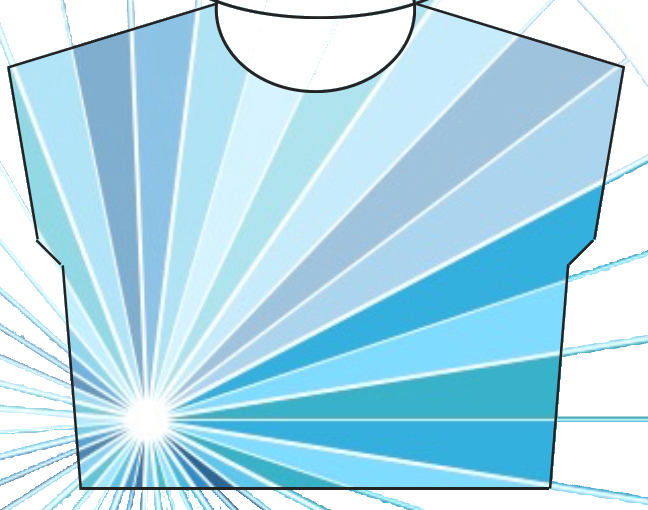 Two YouTube videos on topic: using Illustrator CS 5.1, Marnie Mac Lean’s video, and using StitchWorksSoftware. 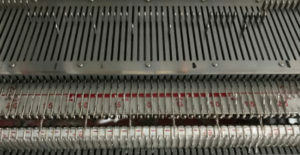 An online generator by Stitch Fiddle, and its associated video. 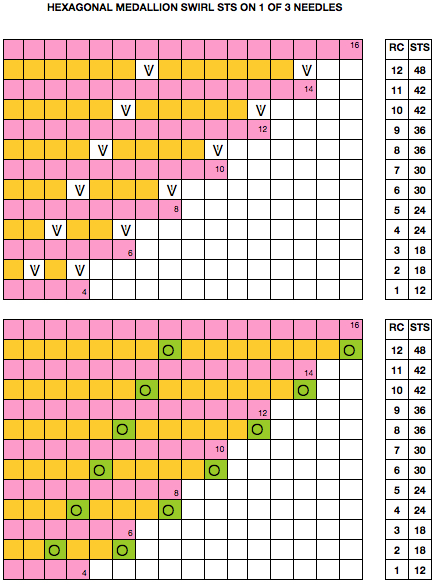 An example: in single crochet, if round 3 had been completed, there would be 18 completed stitches. Chain 18, either slip stitch or continue in spiral to match count at that point. 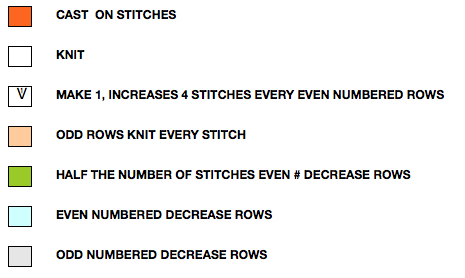 For round 4: increase every 4th, round 5: every fifth, round 6: every 6th, round 7: every 7th stitch. I tend to swatch in easy to see colors, “friendly” yarn, and use tools that allow moving in and out of stitches easily until I have techniques sorted out. 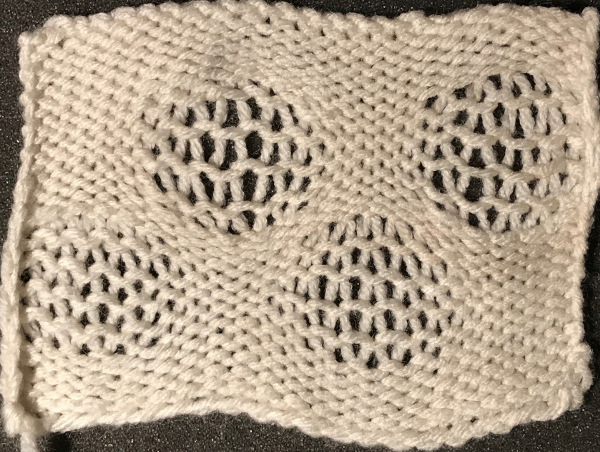 When knitting circles in the round, things get a bit more complex, particularly if one begins to introduce items such as round yokes with patterns into garments where gauge matters significantly. 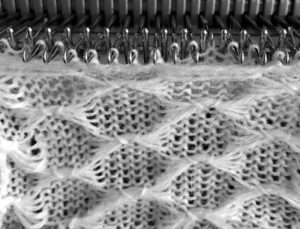 I have an extensive library on both hand and machine knitting. I am not the originator of the base drawings for these illustrations. They have been however, accumulated from various decades old sources, edited by me for content, color, size, etc. My editing program is gimp. I will review, alter, or add to this library over time. 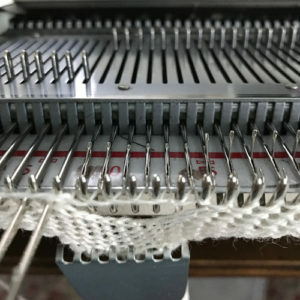 Many hand knitting patterns are published, often in garter stitch, using slits that one may think of as larger “buttonholes” to create a range of interesting fabrics. 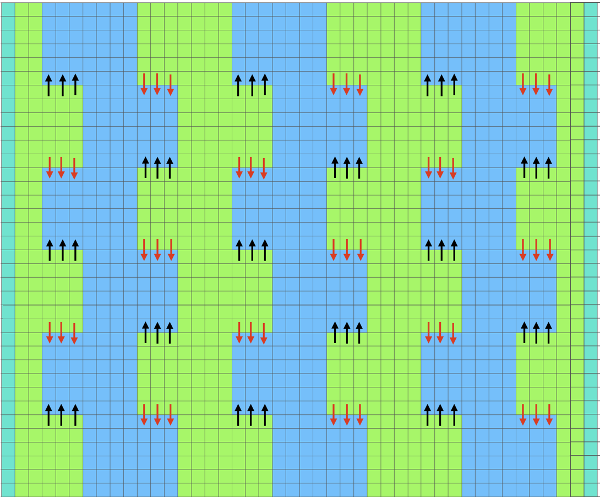 Trying to produce such slits single bed, without the use of additional strands of yarn and in turn having yarn ends to weave in, leaves few options. This method may be used when creating multiple slits across a row as well. 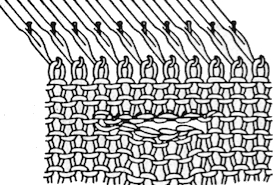 Holding is used to break the knitting into segments. 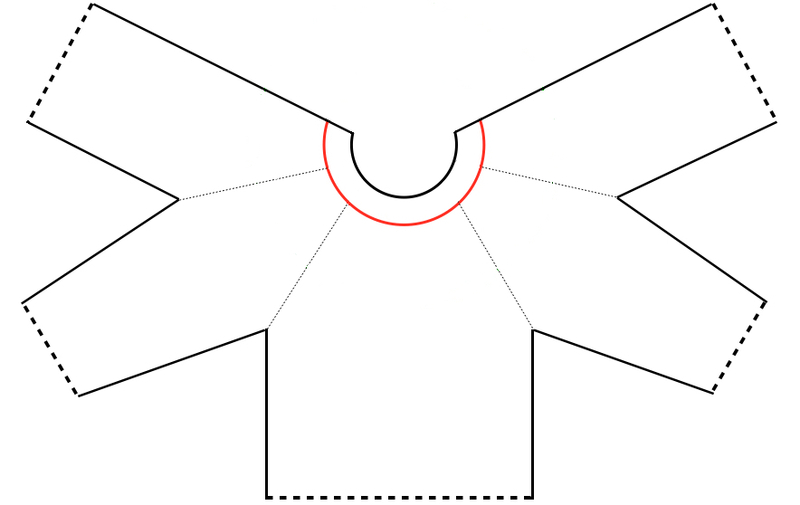 The drawn illustrations show steps taken, not needle positions.